Celebrate - gluten-free cinnamon rolls! If you read my post about Sally's Gluten Free Bakery's killer cinnamon buns, and decided to check them out for yourself, you might have played a part in the bakery choosing to offer them every Friday and Saturday until future notice. Yes - celebrate indeed! Here is the newsletter that recently went out to share this fabulous news with Sally's customers. Please read it and weep...with joy, of course! Oh my - it's great to be gluten-free in the ATL these days! Making a traditional tasting pie crust made without gluten ingredients isn't particularly easy in my opinion. For a ready-made crust, the Kinnikinnick product is very good, but the crusts are fairly small. To get one regular 9" crust, you need to defrost and roll out the two KK crusts and roll them out into one large crust. That is kind of a lot of work as well. For the easiest gluten-free pie crust ever, the cookie crumb crust can not be beat! For chocolate & peanut butter pie or chocolate cream pies, use gluten-free Oreo type cookies. For lemon bars, use graham style crackers or gingersnap cookies. For a more traditional crust, sugar cookies can be used, but you might need to add a pinch of salt to counter balance the sweetness factor. The cookies should be crunchy - not soft - in order to make the best crust. Cookie crust recipes are bountiful on food.com - just remember to use GLUTEN-FREE cookies if using a regular cookie crust recipe. All the recipes I've found and used require butter so I don't know how non-dairy butter substitutes works in cookie pie crust recipes. I recently made lemon bars using Three Bakers graham crackers for the crust and the glutenoids we served them to wanted seconds. They don't eat gluten-free and, truth be told, might go out of their way to avoid gluten-free replacement foods. I've also used crunchy ginger cookies from Trader Joe's and Pamela's for the lemon bar crust. The result is always the same - most people want more than one bar and many ask for the recipe. And isn't that why we bake to share with others in the first place?! Another find on FindMeGlutenFree.com is Mama Bakes Safes Cakes in Alpharetta, GA. Honestly, there are very few gluten-free, vegan cupcakes I've found worth eating so when I tried the goodies from this bakery, I tried to keep an open mind. Understand that I've had delicious vegan cupcakes before - just not that many of them. Even though I'd still choose a cupcake made with butter and eggs over any other version, the cupcakes and frosting from Mama Bakes Safe Cakes were surprisingly good! Like 'I can't believe the're gluten-free and vegan' good! My husband won't usually even taste any vegan baked goods, but I convinced him to try a cupcake and even he was impressed. HE asked me at least twice if I was sure there were no eggs in the cake or butter in the frosting. The staff at the bakery takes great care to explain which allergens their various goodies are free of (gluten, soy, dairy, eggs, etc.). There are many things available to order to even pick up from the freezer out front at the bakery. One such item that got my attention was lemon cookies coated in powdered sugar. I don't recall the name of them, but they were by far the favorite thing we tried and I will be going back just for those incredible cookies! 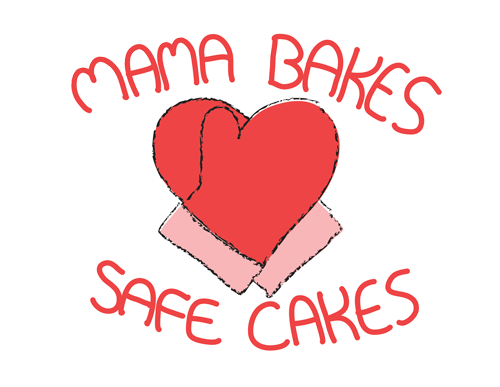 If you're in need of gluten-, egg-, dairy- and even soy-free fresh baked goodies in the ATL, you might want to check out the wares from Mama Bakes Safe Cakes. They accept walk in sales, but if you want to check out the cupcake flavors of the day, you can find them on the company's FB page. Gluten-free crepes in the ATL! Crepe Revolution went out of business quite a while ago. I can't speak to the gluten crepes there, but the three gluten-free options were less than impressive in my opinion. Because I love crepes, I routinely google 'gluten-free crepes atlanta' and what normally pops up are regular crepe places that don't have gluten-free options. Then a few weeks ago, that changed. 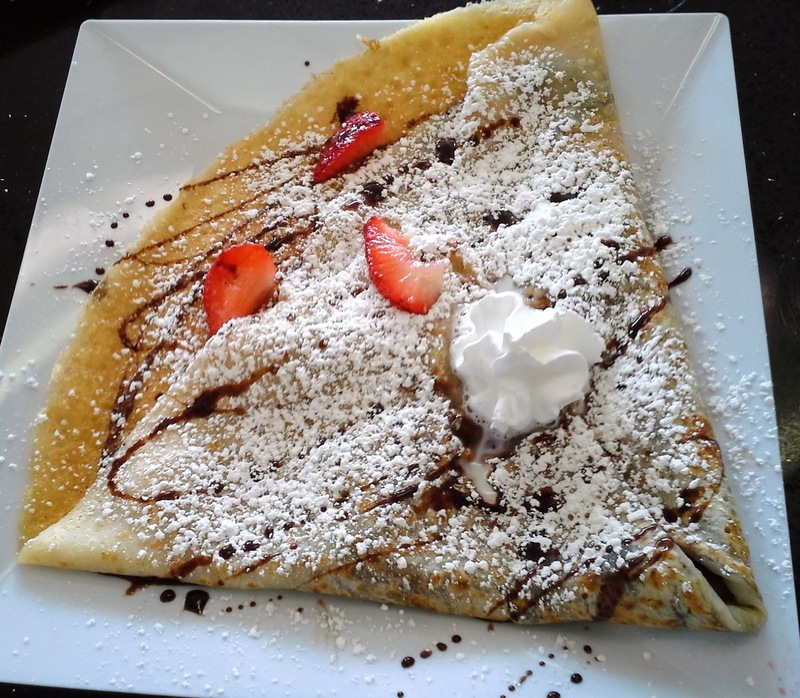 Meet Crepe Cafe in Marietta! The 500 degree griddle is cleaned (possibly with water only) before being used for the gluten-free batter. Since I've successfully had crepes made that way before, and knew that the cafe serves many gluten-free patrons with celiac, I decided to give it a try. We got one savory gluten-free and one regular crepe for lunch and a gluten-free dessert crepe for dessert. 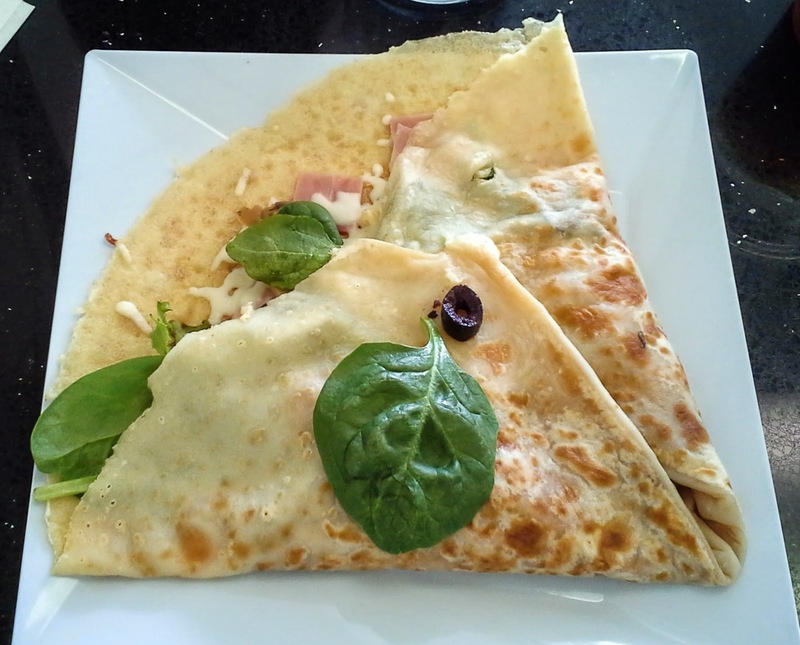 Each gluten-free crepe was delicious...light and airy...just like a crepe should be! All I could think was 'I hope they didn't mess up and give me the wrong batter' - it was seriously that delicious! The regular crepe that I couldn't try was said to be not quite as light as the gluten-free version, but it was none-the-less tasty. My only complaint is that there is only one location of this gluten-free gem of a cafe in the area! Gluten-free brunch in North GA! Buffet-style meals can be hit or miss when it comes to being gluten-free friendly. Knowing what the safe options are and the placement of those dishes are equally important. That said, you can find wonderful buffet meals here and there. With the heat continuing to rise in the ATL, we wanted to head to the cooler climate in the North GA mountains recently. 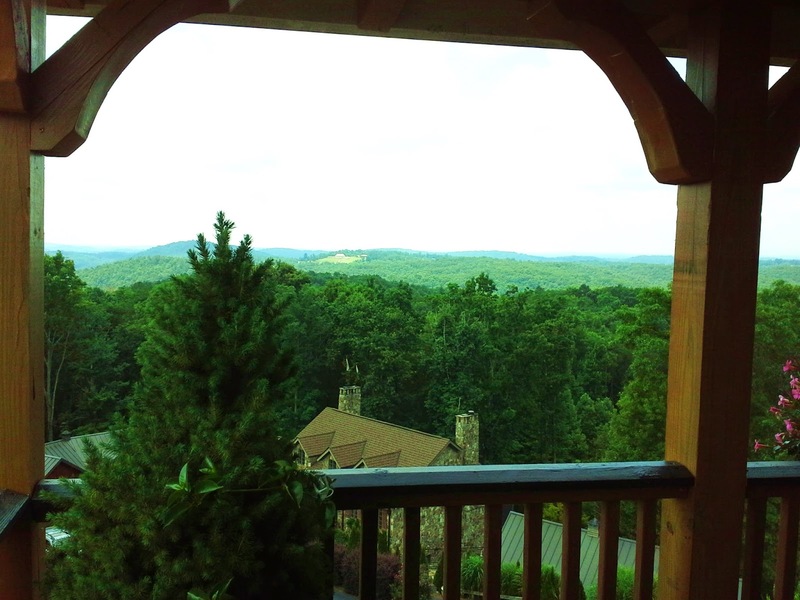 We enjoyed the wine tasting flight at Wolf Mountain Vineyards a few years back and remembered how lovely the view was there. This trip we decided to check out their Sunday brunch which has two seatings - 12:30 and 2:30 pm. Since we wanted to sit on the covered patio, we chose the 12:30 option and let them know in advance I needed a gluten-free meal. As always, I let them know I wasn't eating gluten-free for fun (although it's more fun than ever these days!). The brunches at Wolf Mountain Vineyard have a theme each month and for July, the theme is BBQ. Overall, the menu was fairly gluten-free friendly. 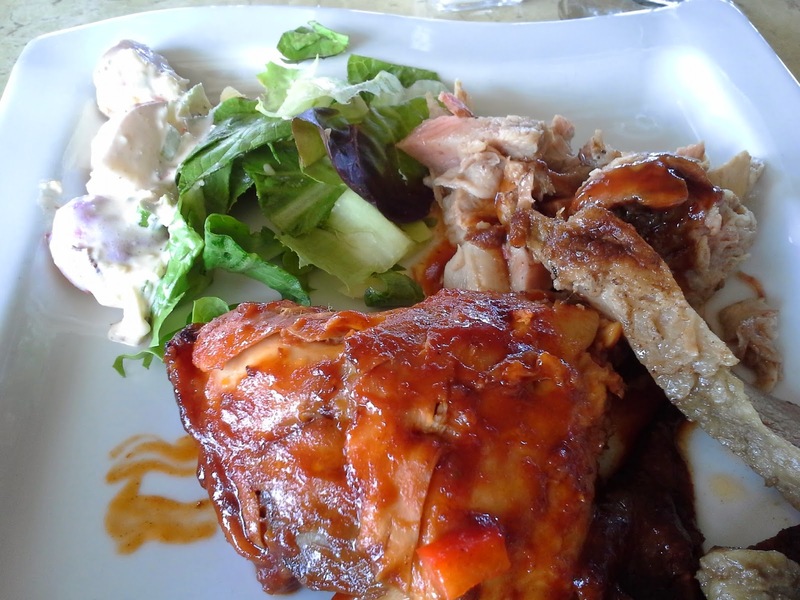 The options on the day we visited included, three types of meat, one BBQ sauce, beans, potato salad and gourmet salad. Since it was my birthday weekend, I requested a gluten-free dessert (if possible) that wasn't fruit, ice creme or creme brulee. The meats were all wonderful, but the chicken thighs were my favorite of the three. So tender and juicy and smothered in a fabulous BBQ sauce! The potato salad was also very tasty and far from the run-of-the-mill version I'm used to. It had bacon in it which makes almost everything better. I skipped the beans because the salad was insanely delicious and I had two helpings of it! Fresh mixed greens topped with avocado, white cheddar cheese, seriously fresh tomatoes and house made dressing - what's not to love?! My husband enjoyed the French toast casserole so I'm going to try to make a similar version with the new bread from Pure Knead (I call it gluten-free wonder bread!). I've made a pretty good recipe for this using a well known gluten-free bread, but it takes a soft and fluffy bread to make it perfect in my opinion. I'll let you know how it turns out later...too hot for that right now! OK - back to the brunch. I was pretty full before my dessert arrived, but once I saw the huge portion of crust-less key lime pie, I could not resist eating at least a 1/3 of it! My husband usually gets my dessert left overs and he was surprised that this time, his portion was less than normal. He had the cobbler dessert which he very much liked anyway. And to the credit of whoever made my dessert, they did more than just pour some key lime filling into the dish. There was a layer of pie filling, then some custard or whipped cream in the middle and then another layer of pie filling. 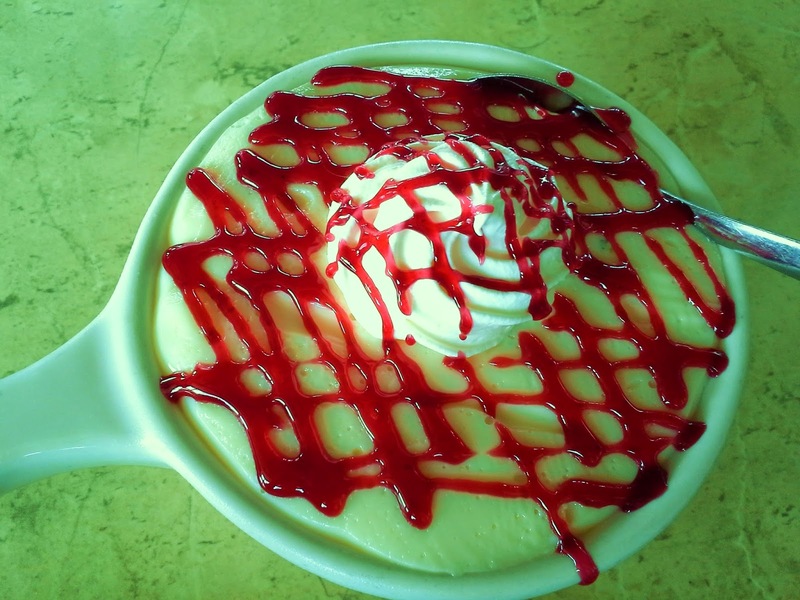 There was a scrumptious raspberry sauce drizzled on the pie filling and a dollop of fresh whipped creme on top! If I'd had a cooler in the car, I probably wouldn't have shared it at all. It was that delicious! Between the wonderful meal, the fun live entertainment and the incredible view and the wine tasting downstairs after brunch, we had an absolutely wonderful afternoon at the winery. We'll be checking out the brunch menus in the future in case there's another one that looks like a good bet for gluten-free options. For anyone interested in the wine tastings at Wolf Mountain Vineyards, you might want to take your own cheese straws from Marilyn's (sold at Whole Foods in the ATL) or order the cheese plate without crackers. Since we were full from brunch, we didn't need a snack. They put out regular bread sticks for the tastings. There are several nice wine included in the tasting, but the Sunset Rose is a perfectly light wine for the long hot days of summer! When my friend, Dionne, told me about the gluten-free rack in the bakery section at a Publix store, I decided I had to check it out the next time I went to Whole Foods in Duluth, GA. Sure enough, smack dab in the middle of the bakery section, there was a small rack with non-frozen treats, breads and muffins by 'All But Gluten'. The line is not at any other Publix that I've checked with so far (which is only a few Atlanta area locations). The Duluth store is at the corner of 141 and State Bridge Rd., just west of Whole Foods. Check it out if you find the line near you! Every so often, I go into a restaurant to inquire about gluten-free options just because I'm walking by it. Most of the time, I'm fairly certain the gluten-free options are either unimpressive or non-existent. Even so, what better way to raise the awareness of the need for gluten-free options than to ask? Sometimes I get the answer I'm expecting like "you can't have anything except our salads" (yes, I still get that one) and other times I'm delighted to learn about something new and gluten-free on the menu. Last week , I picked up some take-out from Zoe's Kitchen (best chicken salad in the ATL!) for a July 4th fireworks picnic. My Zoe's location is literally attached to a Corner Bakery Cafe so I dashed in to inquire about gluten-free options there. To my surprise, I was told that they'd started offering gluten-free sandwiches that week! I'm not sure why, but I was told they had gluten-free bread that day and when I called back to get more info, I was told they only have gluten-free pita bread... Either way, they apparently have something to make gluten-free sandwiches with. You can check out the locations that possibly have gluten-free bread, pitas or something to make gluten-free sandwiches with here. 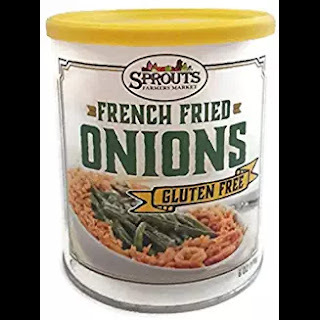 There is an allergen list you can request to check for sandwich ingredients so it doesn't seem that gluten-free friendly in terms of ordering, but I'm definitely going to check it out soon! It's hard to see all those yummy desserts in the cases up front (none of which are currently gluten-free), but maybe if the gluten-free sandwich program proves lucrative for the chain, desserts will be next on the menu! Please DO NOT order anything at this chain without inquiring about all the ingredients in whatever item you want to order. The allergen list should help you confirm what is and is not safe. Eat out at your own risk! Greenville is pretty gluten-free friendly for such a small city. We go there several times a year to visit in-laws, but often make it a day trip which doesn't allow for time to check out the gluten-free dining in the area very often. During a recent day trip on Father's Day, we decided to have an early dinner downtown before heading home. In the past, we've been to Larkin's on the River and while the crab bisque there is both gluten-free and amazing, the service is hit or miss. My husband doesn't like going to places where he thinks the staff might mess up my meal so we haven't been to Larkin's in a couple of years. However, the people who own that place also own Grill Marks which happens to be a very highly rated burger joint in downtown Greenville. We decided to check it out and we are so glad we did! Grill Marks is a trendy gourmet burger place much like those found in the Atlanta area. There is a neat patio out front which is perfect for people watching. It was beyond hot when we were there so we sat inside. I guess it was due to the high ceilings, but it was very warm inside and the A/C was definitely on since it was cooler inside than outside. It was also muggy which made for a very uncomfortable feeling - one where you can barely enjoy your food no matter how good it is. Because everything we ordered was hot food - much of it fried - it wasn't as great as an experience as it would have been on a cooler day. The best part was the food which was really quite tasty! The menu offers gluten-free buns, fried green tomatoes, three types of fries and many more gluten-free options. The friendly server went all the gluten-free menu options, and noted some dairy-free options as well. 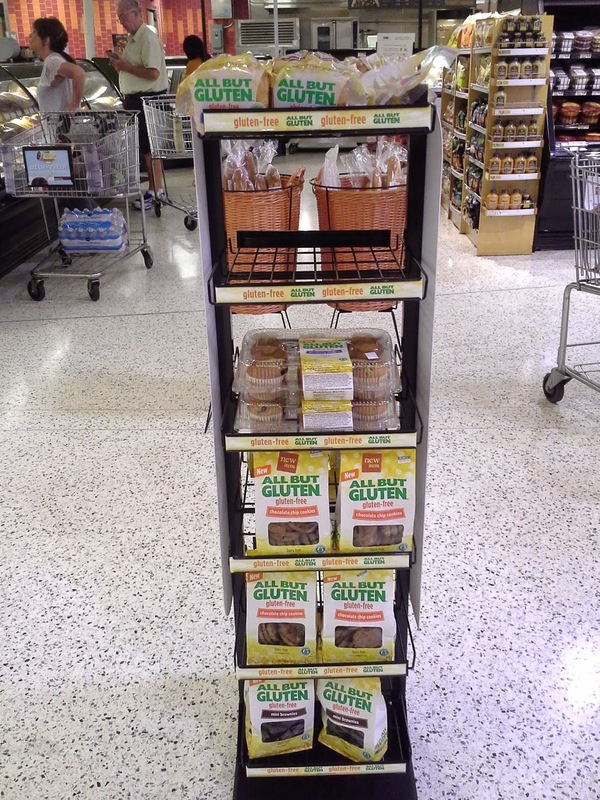 It was exciting to find out that many more things are available gluten-free than those that are not. How's that for a nice change?! The burgers are not cooked well done unless you request it, which we did. The gluten-free bun was too thick for me, but I almost always find that to be the case. The batter on the tomatoes was too 'cornmealy' for us, but the green tomatoes and sauce served with them were amazing! The 'fat' fries were seriously addictive and I actually took some of them home so we could get dessert. I'm not sure I've ever seen gluten-free cobbler on any menu so of course, I could not resist ordering the cobbler-of-the-day which happened to be strawberry. When the dessert arrived at the table, I knew there was a good chance I wouldn't care for it and unfortunately, I was correct. The cobber bread part made up 90% of the dessert. The other 10% was made up by the fruit part and really good ice cream. The bread part of the dessert had a bad flavor and texture. There are several fabulous gluten-free flour blends available in Greenville so it's unclear why Grill Marks isn't using one to make this dessert. Maybe we were there on a bad day when the person who usually makes the cobber was out and what we had wasn't representative of the cobber they usually serve - I don't know. If my husband could stand to see food go to waste when even he doesn't think it's any good, we probably would have asked for the dessert to be taken off the check after only a bite. The good news is that the burgers, fries and appetizers at Grill Marks are more than enough to fill anyone up. We'll likely go back on a cooler day to enjoy a nice gluten-free meal served with a smile and great Southern hospitality! Tupelo Honey is expanding all around the South. I remember going to the location in Asheville eons ago when it was a true 'hippie' joint. Now there are two locations in Asheville and others in NC, TN and SC (cities listed below). We checked out the gluten-free menu at the location in Chattanooga during Easter weekend and it was really impressive. They have gluten-free bread for sandwiches and their hot housemade pimento cheese dip. There was nothing interesting for dessert during our visit and while it's not surprising, it's still disappointing when companies have creative menus except for the dessert options. The vibe at Tupelo Honey is much more corporate than at the original location which is to be expected from a quickly growing regional chain. However, the gluten-free menu makes it worthwhile to dine at if there's a location in your area. To view the complete gluten-free menu, chick on the location and then download the menu: Tupelo Honey Cafe. The vegan and soy free options are also noted on the gluten-free menu.